Every year about this time I haunt my local Traders Joe’s, waiting for the grand entrance of the peonies – my favorite flower of all time. They come in small bunches, five to six buds wrapped up in cellophane. If you weren’t aware of the amazing grandeur locked away in the little golf-ball-sized buds, you could easily pass them over for seemingly prettier flowers. But two days later, those tiny buds will unfurl and you’ll be grabbing your camera in shock and awe as the petals unfold in an ombre of glory. Peonies are the drama queens of Spring. 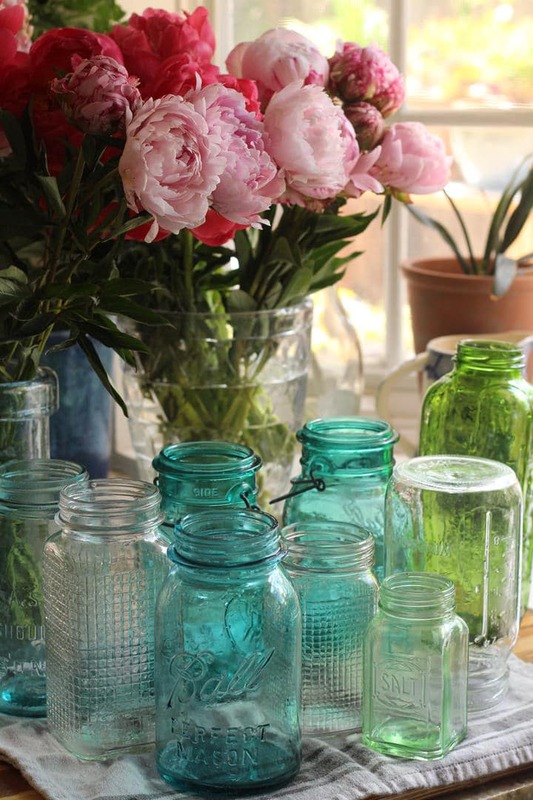 My favorite thing to do is gather my collection of vintage jars, wash them all nice and clean and fill them with bouquets that I strategically place all around my house. One in the bathroom (did I mention they smell divine? ), one on my dresser, one at my desk and of course as many as I can fit on my dining room table. 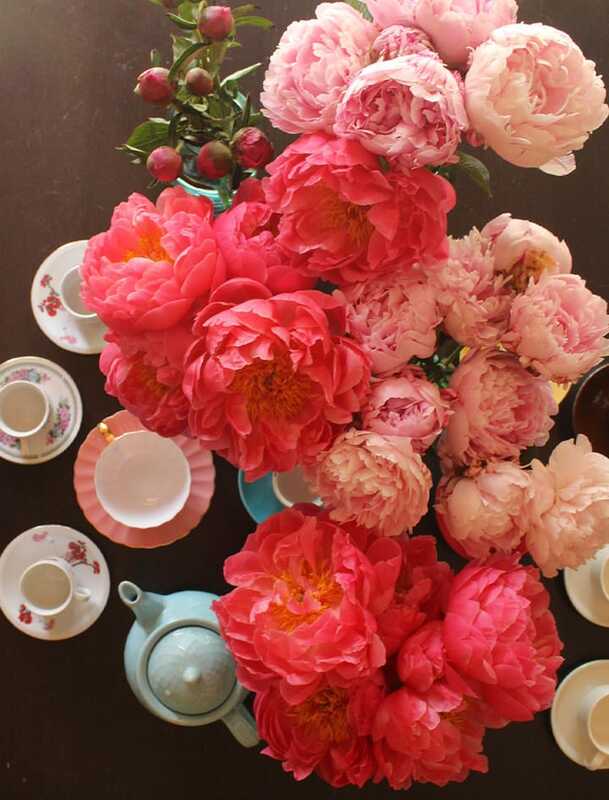 Personally, I’ve been known to host parties around peony season itself. They are the ultimate decoration, demanding attention with their blooms that can reach up to six inches in diameter in a wide variety of colors. (You can’t get them in blue, unfortunately– look for delphinium if you’re hosting a blue-themed party.) Yes, sometimes they might even steal the whole show, forcing you and your guests to sit on phonebooks so that you can still see each other from across the table, but if you’re looking for a big impact peonies will never disappoint. 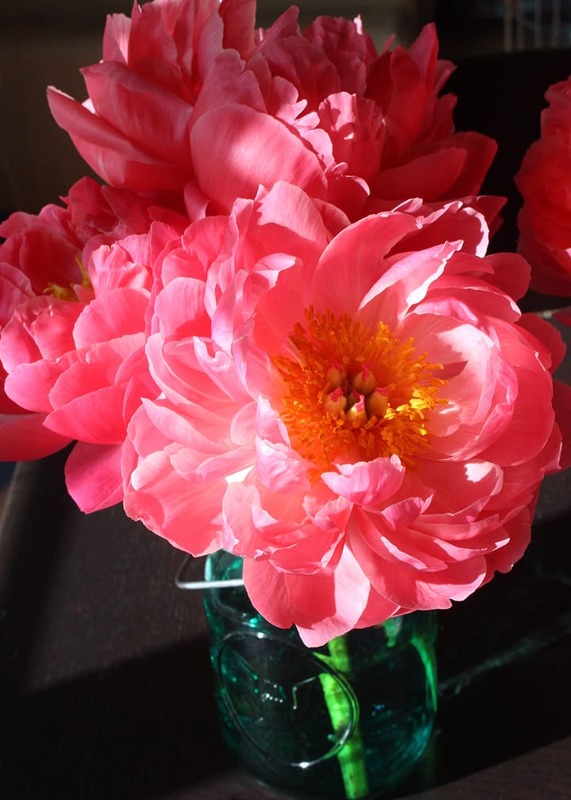 If you aren’t lucky enough to have a Trader Joe’s in your neighborhood you can also find peonies in high-end grocery stores or special-order them from boutique florists. If you are more adventurous, you can go directly to the source and buy them at your local flower market in any big city. But make sure you check online first if you don’t have a resale license; many markets are closed to the public, but may offer open hours on the weekend. Be sure to go early! The best flowers are always gone by 8am. 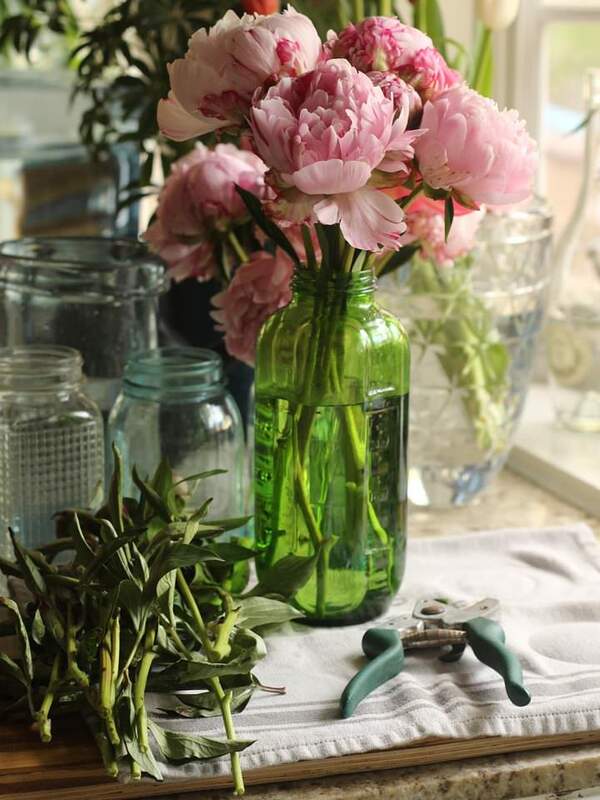 When making your bouquets, give your peonies a fresh cut and remove any leaves that might fall below the waterline. 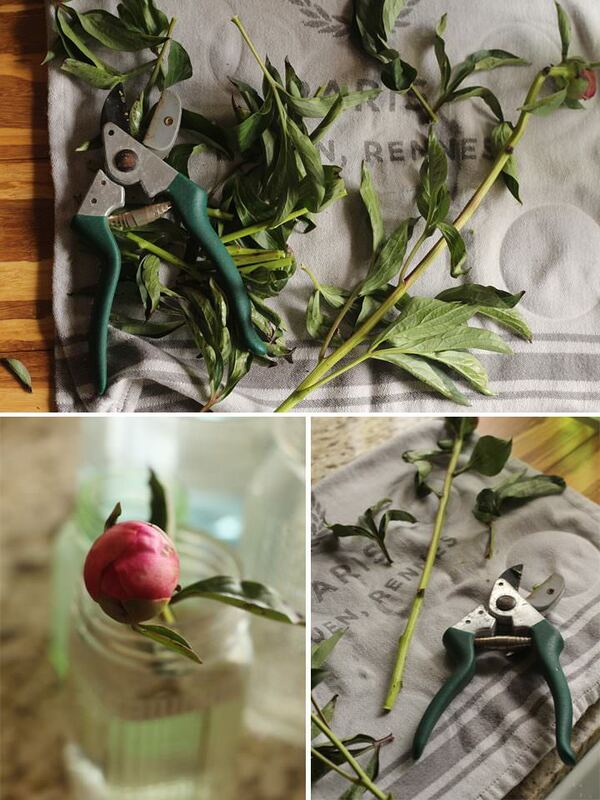 This helps the water stay fresher so that your peonies last longer. Peonies also like to stay out of drafts and away from direct sunlight, so keep this in mind when you’re placing them around your home. I’m not the only one to wax on about the beauty of this majestic flower. Peonies have a long and illustrious history in art and medicine. They were very popular in Imperial gardens in China and were even put under Imperial protection during the Tang dynasty. From there, they spread to Japan where they were cultivated (and grafted) to create even more beauty. Ancient Chinese and European medicine used the roots, bark, seeds and flowers to cure anything from bladder stones to jaundice and even menstrual cramps. Today over 262 compounds are extracted from the peony and used to treat a variety of illnesses, including treating muscle cramps and preventing blood clotting. The name peony itself comes from Greek Mythology. Paean (also spelled Paian) was a student of Asclepius, the Greek god of medicine and healing. When Asclepius became jealous of his pupil, Zeus saved Paeon from the wrath of Asclepius by turning him into the peony flower. Then, Paeon gave peony seeds to Hades to heal him from an arrow wound inflicted by Hercules. Many poems and songs have been written about the peony. In traditional Chinese and Japanese art, peonies often represent female beauty, as well as wealth and status. In western poetry, references to the blossoms have been used to evoke spring, ephemeral beauty and fleeting infatuation. 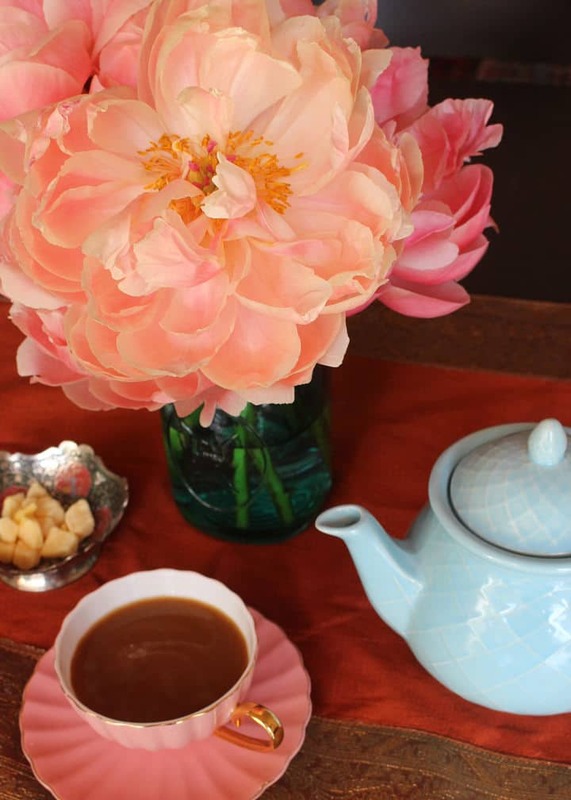 Whether you are sitting by yourself having a solitary cup of tea or hosting an elaborate dinner party, peonies will always be a welcome guest. Pull up a chair and watch the show. Act fast– they’re in season now, but not for long! During spring we all can see a beautiful face of nature and we can also get the inspiration from this season for our home decors, this is the most lovable season and also boost our mood if we follow the trends of spring decoration for our home. We are using different flowers for home decoration and peonies is the popular one for home design. Here we follow the instruction on how to take care of our peonies and adding it to home decorations. 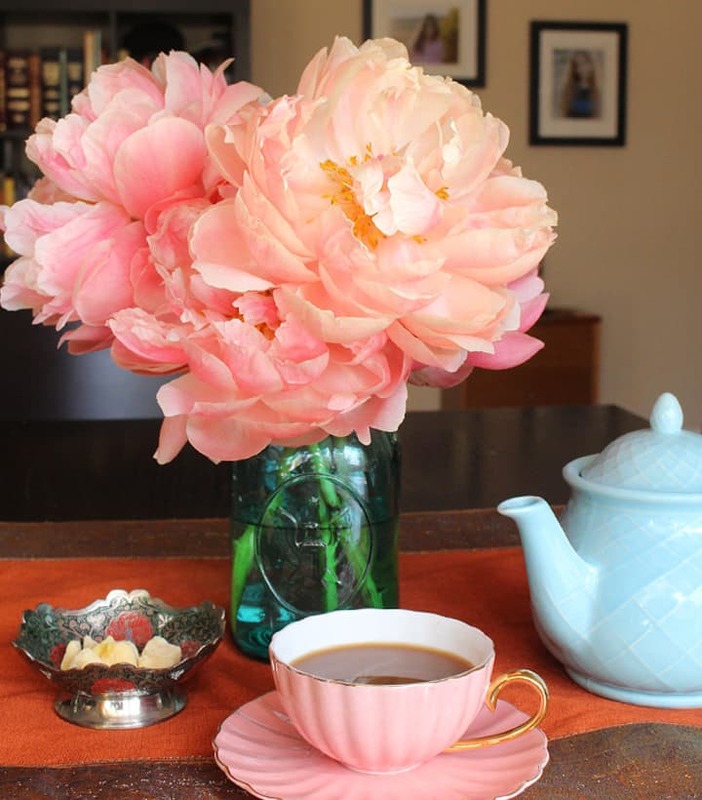 I am fortunate to have peonies in my garden, but have never cut them to display in my home. I will be doing that this year. Thanks for sharing! Lovely! 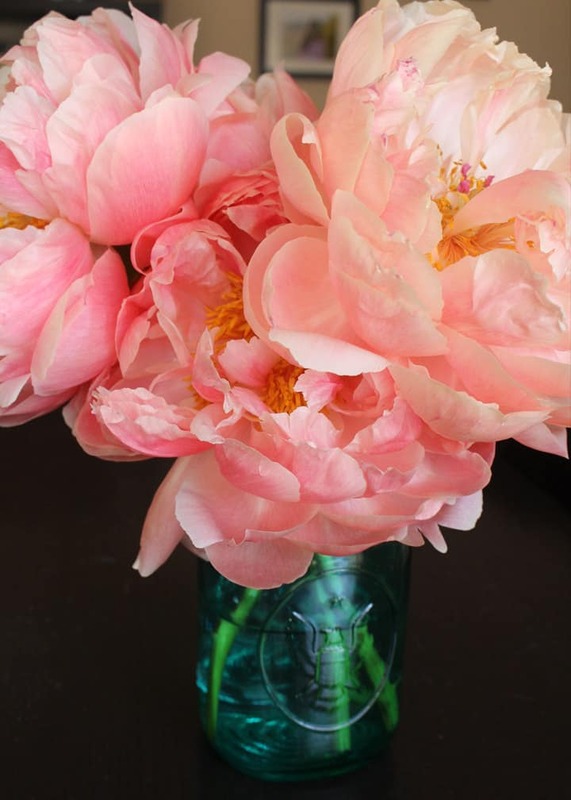 My favorite display is to take one gorgeous peony and float it in a beautiful cut glass bowl. Exactly how my mother taught me to display their “top heavy ” beautiful bloom. She’d add a few sprigs of their leaves to the water first, as all flowers must have greenery. Thank you for the memory reminder.